Nice single villa as a luxury brick house located in a palm and pine trees garden, thatpermits a confidential peace holiday, because of it turns all around the property. 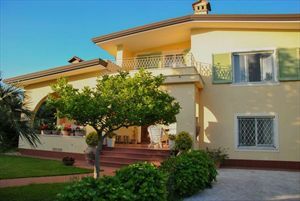 The villa is located in the centre of Forte dei Marmi and near the seaside:the distance is 600mt. An alarm system overcontrols the villa and the own private parking. The entry is controlled by automatic gates. main entrance, a broad saloon with dining area and relaxing corner (sofa in front of fireplace), kitchen full-equipped, 3 double bedrooms,2 bathrooms.